During its active phase, in the months approaching the Sun and after its perihelion passage before it was too far away, the ice sublimation on the surface of the comet 67P/Churyumov-Gerasimenko caused jets with ejections of materials from its nucleus. They were very regular and occurred every time the rotation of the comet’s nucleus exposed an area to sunlight. However, the Rosetta space probe detected other very different and above all much more violent phenomena, so fast that each of them appears only in a photo. The limited images have forced scientists to estimate the characteristics of these explosive events and make it difficult to tell whether a photograph was taken immediately after the explosion’s beginning or at a later stage of the process. It’s estimated that an event could last between 5 and 30 minutes and in this short period between 60 and 260 tons of material could be ejected from the nucleus of the comet 67P/Churyumov-Gerasimenko. 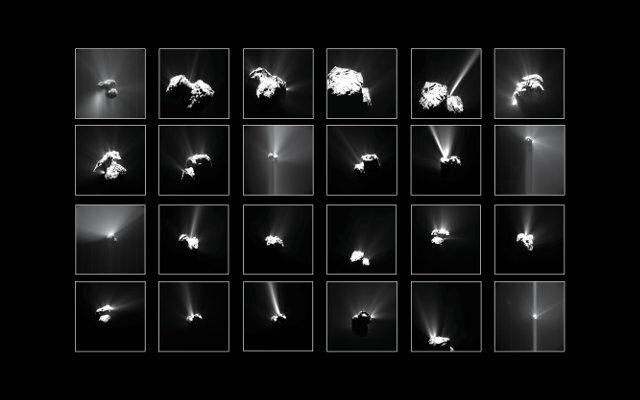 According to the reconstructions, in the period around the perihelion passage, the outbursts on the surface of the comet 67P/Churyumov-Gerasimenko occurred every 30 hours and can be divided into 3 categories. The first is associated with a long, narrow jet that extends away from the nucleus. In the second there’s instead a broader base that expands more laterally. The third category is a hybrid of the other two. The problem is that because of the limited images it’s not possible to determine whether the three categories of outbursts correspond to three different mechanisms or they are three different phases of a single process. It would be necessary to have more pictures of an event to understand it but scientists have had to make do with one per event. If there were only one process in place, the logic sequence would be an initial long narrow jet with the dust ejected at high speed, very probably from a confined space. Subsequently, when the surface around the exit point changes, a greater fraction of fresh material is exposed, expanding the plume’s base. At the end, when the home region has been altered so much that it can no longer support a narrow jet, just a broad plume survives. Most of the events occurred shortly after the Sun rose on the affected region of the comet 67P/Churyumov-Gerasimenko. The others occurred after local noon. This suggests at least two different causes for these outbursts but more data indicate that there’s at least one more. In the case of the events that occurred shortly after dawn, it’s possible that the thermal shock that hit the area generated a sudden fracture resulting in the violent ejection of materials into space. In the case of the events that occurred after noon, it’s possible that the accumulated heat penetrated into the ground reaching volatile materials that vaporized explosively. Most explosive events occurred in marginal regions of the comet 67P/Churyumov-Gerasimenko, where there are changes in the topographic structure of the terrain with steep cliffs, pits and alcoves. It’s possible that those are areas particularly susceptible to erosion and this will favor events of such violence. This may explain why at least one event occurred when in the area it was night. The Rosetta space probe’s mission is about to end but the huge amount of data collected during many months keeps on being studied. This research will help to understand the evolution of comets, especially during the periods when they approach the Sun and become active.